Every now and then I hear a sad story about some stupid tourists who decided to drive through one of Africa’s many safaris in their car without a guide and they end up trampled or eaten to death. I typically shake my head and say how sad and how STUPID. Who would drive into a safari without a guide, I asked myself. Strangely enough, you do not need a ranger to tour Kruger National Park. It’s possible to drive right in with your car. In fact, we saw many folks doing this, one with a tiny Nissan. It is very possible, however, that three things are likely to happen: 1) you’ll get lost because the roads are one big maze; 2) you’ll die because elephants and rhinos can easily trample small cars; and 3) you won’t see much without the help of rangers communicating where the animals are. 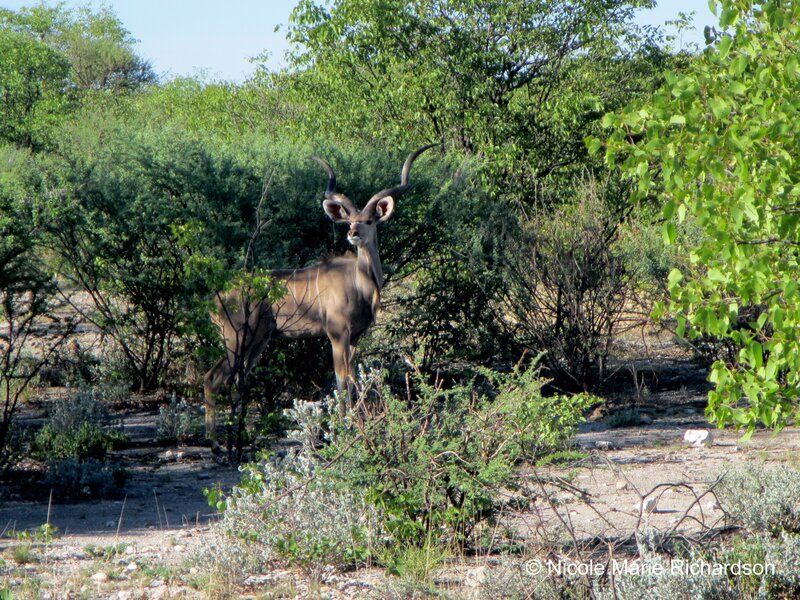 So that morning, after leaving Tangeni’s family farm, we set off just a few miles to the nearest gate into Etosha…but not before stopping to get some provisions, such as extra gas (in case my worst nightmare came true) and some snacks from the outdoor market. The market was bustling even at the early hour of 8:30 a.m. with locals. Everything from boiled corn and fresh fruit to raw and cooked meat was on sale. I tried some corn but it was not as sweet as I’m used to and I toyed with the idea of popping one of those dried mopane worms, called omagungu, into my mouth, but quickly came to my senses. Tangeni gave me a tour but decided against showing me the slaughter house in the rear of the market. I thanked him kindly. Then we piled back into the truck and headed to Etosha. 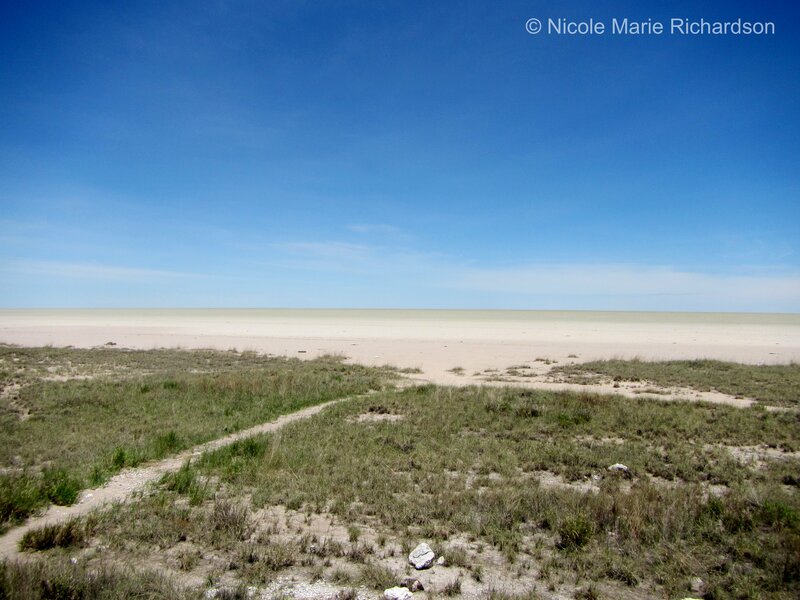 Established in 1907, Etosha is best known for its huge salt pan–the dried-out remains of a former lake. Although the lake is empty, from a distance the salt pan looks full. The illusion makes for stunning photos. Tangeni explained to me that self-driving is the preferred way to do a safari drive. Only certain parts of the park are accessible to self-driving tourists however–the eastern part from the von Lindequist Gate to the Andersson Gate. The western part is only accessible as part of a tour or to guests of the lodge in this specific area. The speed limit is an agonizing 60 kilometers per hour (although I saw a few people speeding) and all visitors have to exit the park before sundown. These two factors make it impossible to see the park in a day. Much of the safari experience is driving for long stretches of time and not seeing much of anything. The park is vast, over 8,598 square miles. So the odds that you’re going to encounter animals at every moment is slim. But as soon as we entered the park we saw a herd of zebra and wildebeest hanging out by a water hole. We also saw kudu, oryx, impalas, springbok, ostriches, warthogs, jackals, and many other small animals. Unfortunately, we didn’t get to see any elephants, cheetahs, or leopards. After a few hours of driving we also saw a few giraffe off a gravel path that Tangeni had traversed many times in his past. He told me that growing up so nearby he visited the park often. He knew how to spot the animals in the distance, he knew what roads to take to get where he wanted to go, and he knew how to behave around the big animals. Although we didn’t have the benefit of someone radioing with the location of animals, we saw quite a lot. Best yet, I could doze when I wanted, snack when I wanted, and fart when I wanted, which is more difficult to do in a safari jeep surrounded by strangers. So I was lulled into a sense of comfort riding in our little white truck without a guide. That was until we happened upon two lazy lions less than 10 feet from the road. They were huge males with massive manes and gigantic teeth. There were about three other trucks blocking the street so Tangeni made a wide circle around them and pulled up right in front of the lions. Our windows were down and we had two babies in the car… I was scared! But I composed myself long enough to take some pictures. Then one of the lions turned his head and looked directly into our truck. That’s when Nankelo started to scream at Tangeni to put the windows up! I could see the lion raising himself up and trotting over to the window and snatching one of us right out the car…thankfully my imagination is more active than reality. In reality the lion fell over on his side and was snoring within minutes. I guess that was our signal that the show was over so we pulled off. We all decided that we had had enough excitement for the day so we headed to our hotel, they call them lodges, which was just 20 minutes outside one of the gates. Before leaving we paid our park fee, which was a little less than $7 for non-Namibians. Etosha Safari Camp was just what I needed after our five hour-long drive through the park and a night on Tangeni’s family farm. My little bungalow had more beds then I needed, with air conditioning, a shower, a flushing toilet, and electricity–things I will never take for granted again. To boot, the camp had a lovely pool and boasted live music every night during its buffet dinner. I was back in the luxury that I’m accustomed to! That afternoon I lounged by the pool and ate way too much. I slept like a log that night tucked in behind my mosquito netting. But we were up at the crack of dawn to head back to the park and do some more animal gazing. That morning we saw a lot of the same but as we were heading toward the gate to exit in the afternoon we saw the pièce de résistance of the entire safari experience–a white rhinoceros. Hunting of the animal has gone virtually unchecked in most of Africa, and the non-violent nature of the rhinoceros makes it susceptible to poaching. What a shame! This animal is so beautiful. Humans should be ashamed for killing this peaceful animal to the point of near extinction and governments need to do more to protect those that are left. 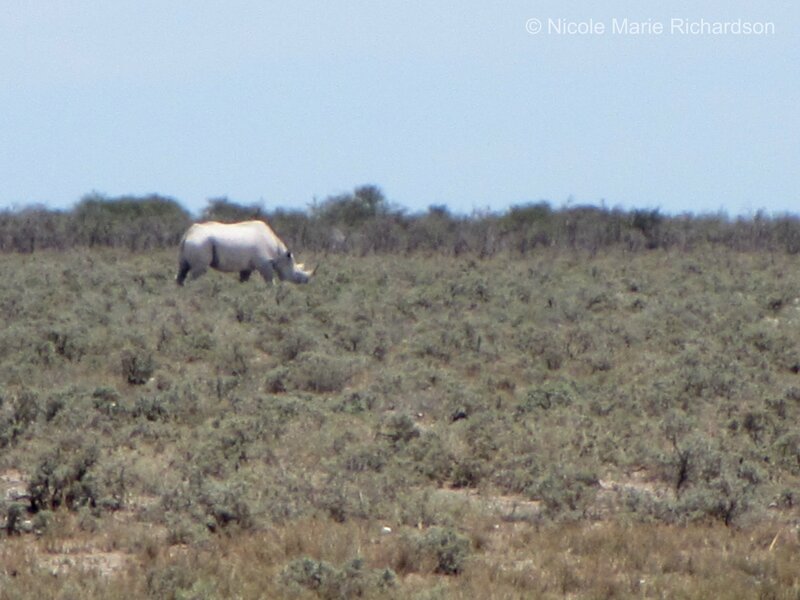 I felt very, very lucky to see one and I hope better efforts are made in the future to preserve the white rhino. After that amazing find we retired back to our lodge for more swimming, eating, and relaxing. This is the way safari should be done! 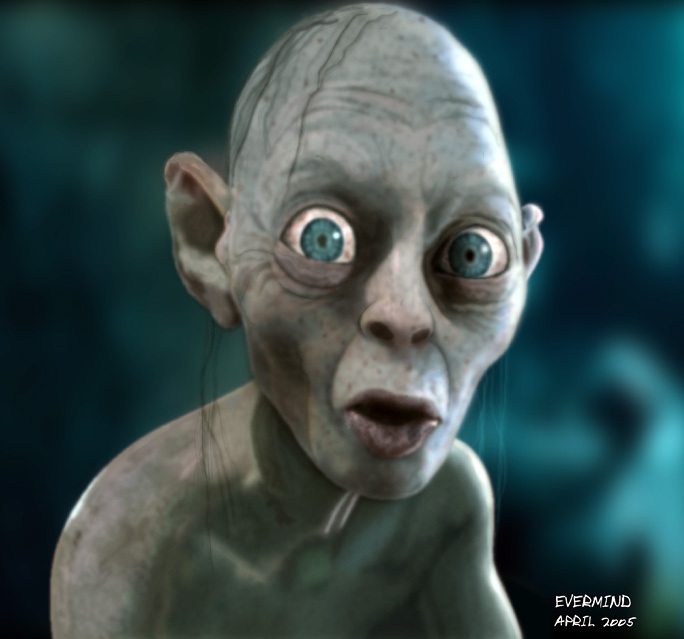 ← The Namibian Published My Blog! !